Twin gear juicers make beverages that provide high levels of nutrition. Twin gear juicers (also known as triturating juicers) usually come with a higher price tag but are well worth it for the die hard juicer. You place the produce into the chute just as with other units. 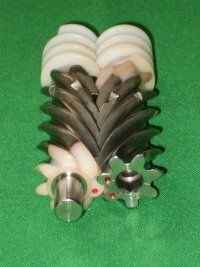 But this unit has two interlocking gears that crush and squeeze the juice out of fruits and vegetables. When in use this machine produces little heat which is a huge benefit. The lower the heat in the process the more vitamins, minerals, nutrients and enzymes are preserved in your drinkable beverage, making this unit a popular choice for die hard juicers. You can purchase a descent twin gear unit for about $400 to $500. 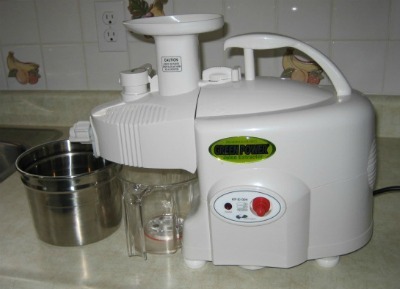 Here's a picture of our Green Power Juicer, it works amazing and we love it. If you are not sure you will be juicing on a regular basis it's kind of pricey if the unit doesn't get used much, but if your planning to be a regular juicer, it's a good choice and well worth it. If you enjoy juicing on a regular basis this type of juicer is a great choice. They are preferred by die hard juicers because of the high nutrient and enzyme value they provide along with a good volume of juice they squeeze out of the produce. Read here why the Green Power Juicer has become one of the number one picks for juicing.